The other day I just happened to be in a used book store. My reasons for being there are my own, so don't even think about asking. They may or may not have something to do with hiding from someone. Someone who might be another version of me, but I can neither confirm nor deny that. It's possible that I accidentally traveled back in time to visit an earlier version of myself to make sure she doesn't make the mistake of her life. I was not successful, if you must know. (I used the Nair on a place I shouldn't have.) 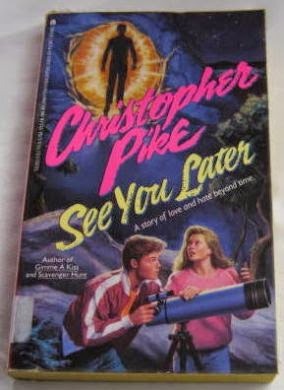 But a good thing did come out of the experience and that is that I happened to be in a used book store that had almost the complete set of Christopher Pike's teen romance/sci-fi/horror novels from the 1990s. With names like Die Softly, Bury Me Deep, and Whisper of Death, these books whispered softly deep into my ear all the things teen girls want to know. Such as, "Should I kill a guy if he gives me herpes?" Or, "Do all scuba dives result in murder?" And finally, "Are all head cheerleaders evil, murderous drug dealers who drive Ferraris?" I used to scrounge for loose change so that I could buy the latest Christopher Pike novel. I loved them with the scary intensity of a cocaine-addled high school quarterback with an axe. Now that I'm an adult, I can read them again and try to decide if they hold up. They don't. See You Later was one of my favorites. It made me cry, LIKE, OH MY GOD, with this pivotal scene at the end of chapter 10. I won't tell you what happened because I can't capture the awesomeness of this scene with stupid wordy words. Instead, I made this reenactment video. You can watch it if you want to.